As well as having a lovely Christmas at home this year, In the evening, I stayed at Andrews house. We opened our presents that night and in the morning, it was like Christmas all over again except at his house. This was the first year I'd spend at Andrews as he normally comes to mine, it was great to see his traditions as well. They do "Tree Presents" Which is basically opening all the other small presents on boxing day! yey. I love opening presents! I'll start with all the things that Andrew got me. I want to do a 'What I Got Andrew' Haul when I get a chance to photograph what I got for him as well! As I said in this post there really wasn't anything in particular that I wanted, not even a MK bag/watch, he did ask but shock horror I must have been the only blogger in the world who didn't want one! Andrew & I are also strange when it comes to presents, we don't really do big surprises, I'd be much happier knowing I bought him something he wanted and he has no idea so we just go and buy them together. The first bits I picked were from Primark - a plain black fluffy jumper because I live in my other one and the warmest snuggeliest hoodie I have ever worn - I've been wearing it every day since. I picked some more clothes from Missguided. I love their skater skirts and already have a denim and metallic blue one. When I spotted this holographic one a few months ago, I fell in love. I've also been wanting a PVC skirt for a while now too. We waited for a 20% off day and got them both for £35. I've heard so much about Snow Fairy that when we were out for dinner at Westfield, we had to have a cheeky look in lush before going home. I wanted to smell it to see what all the fuss was about and I agree. Its amazing, it smells so sweet and sugary. I picked the small one just to see what I thought but Andrew ended up buying me two more and some other bits in the boxing day sale too! I'm hooked. These last two were actually all Andrews choosing and he did well! I love the colours on the t-shirt and they are a little bit sparkley too! He knows I love glitter & how can you go wrong with a River Island voucher?! And lastly, he got me the super cutest card ever. Im counting this as a present because I know how expensive this was. I did send him to my favourite card shop to pick me a card after all haha and he picked well, its super cute! Andrew's sister and her boyfriend got me a Hollister voucher (Which always comes in useful, I get all my tracksuit bottoms there) and some chocolates from Hotel Chocolate, These Tiddly animals seem to have become a bit of a tradition with Andrew family, They are different every year! And from his parents! I was shocked at how much they got me, it was a lovely suprise. They were the only presents that I didn't pick myself and I love everything they picked! 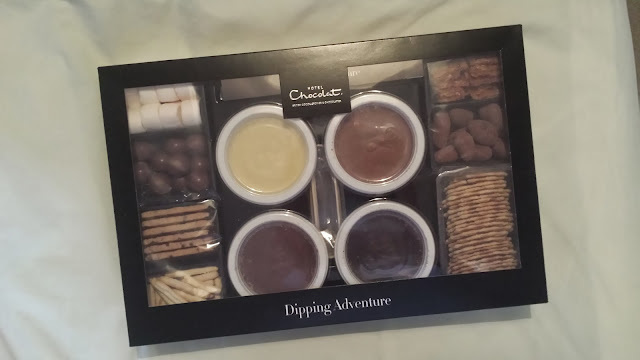 And last but not least, they got the chocolate fondue set for me and Andrew to share, he's definitely not a big chocolate fan so I'm very looking forward to sharing it with him hahah. And thats everything! I was so lucky this year and got so many lovly presents from everyone! If you want to see what me family bought me, check it out here. That Holographic skirt is to die for! I loove the cup with your name on it too! ah the hotel chocolat kit looks so yummy! looks like you had an amazing christmas, i love your missguided goodies too, they've had so many treats new in over the christmas period! All these presents are perfect and unique, I would be happy to have all of them! This year was glad to receive tasty chocolates and good-looking clothes. You can see different reviews on Edusson.com that I made after holidays. I like to receive presents that could be used every day.